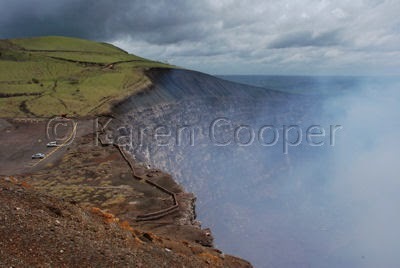 The Santiago Crater of Masaya Volcano is huge. So big it's almost hard to imagine in a shot without some reference to size...like the teeny cars in the view above. Driving up to the crater through Masaya Volcano National Park makes you feel like you are in a totally different world. Lava flows with jagged rocks of all sizes litter this eerily beautiful landscape. Your first glimpse of the cross marks Santiago Crater. Huge billowing clouds of sulpher dioxide "smoke" look like visions of the end of the world. And smell like it. You are asked to park you car backside in at the viewing area because of the activity of this volcano in the recent past. Which is totally understandable when you see the fractures in huge chunks of rock seemingly ready to take the plunge over the side of the crater and become the next sacrifice to the Volcano Gods. This is real raw life stuff...the earth is being born and reshaped right in front of your eyes. And nose. No doubt about it, it smells toxic here. Makes my knees go all wobbly being this close to the center of new life. Or maybe that was the earth shaking .....! This is a great blog. I like the way to blog about ONE photo and tell us how to get there. Keep up the great work!